Reviewing Authority's Recommendations: It is reported that the accused stated that he would be "strict and severe" upon arrival at the camp. Accused ordered the beating of POWs for infractions of the camp rules (disorder, failing to salute, stepping out of line, smoking, losing items of clothing/bedding) or for no reason at all; the accused was present at times when POWs were being beaten, abused. Furthermore, when POWs attempted to protest their treatment to the accused, he told the POWs that they were never to come to him with complaints and stated that the guards had full authority to "mete out any punishments they so desire" and that the guards had "full power of life and death over all prisoners, officer included." 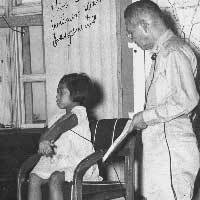 Reviewing Authority: Accused stated that when he came to the camp he told the Japanese personnel that they should see that the prisoners followed regulations; at the same time, he told them that they weree not to treat the prisoners unjustly and to never "hit them or slap them." He never ordered a POW to be beaten; no beatings were ever reported to him; he did not know of any beatings that happened; and when he did see a subordinate mistreating a POW on one occasion, he stopped him and reprimanded him. Prosecution Arguments: Record is legally sufficient to support all the findings except that of 2d. Inn 2a, 2c, and 2e, it was shown that either the accused was present at the time of the beating or was informed of the beatins and did nothing to prevent these activities. With respect of 2f, numerous beatings happened while the accused was commander of the said camp. Although the accused knowledge, "the beatings were so numerous that he must have known that they were taking place, or if he did not know, as commander of the camp, he should have known what was taking place." Regarding 2d, "where the facts are such that the commander, even if exercising due diligence, would not be apprised of beatings of a POW by a subordinate, it is difficult to see how he can be held guilty of the offense committed by the subordinate on the theory of command responsibility." Therefore, findings in this sub-spec is not approved. Judge Advocate's Recommendations: Lt. Col., Allan R. Browne, JAGD, disagreed with the claims of the reviewer in regards to specification 2d. He stated that "the slapping charged therein occurred over a long period of time and during accused's regime under circumstances indicating that he was fully cognizant of and concurred in other mistreatments of a similar nature. Thus, scienter is imputed to him to the extent that he should be held criminally responsible."